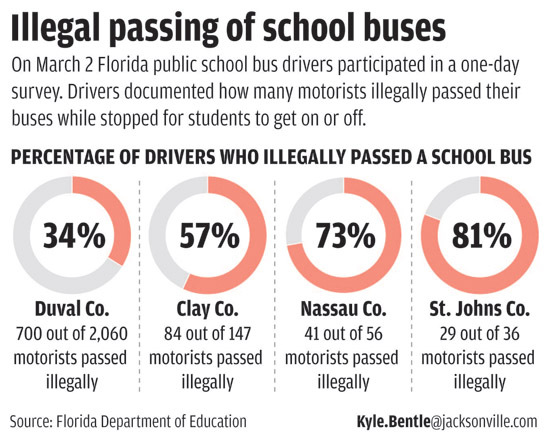 In the below infographic, Florida public school bus drivers participated in a survey to determine how many people illegally pass a school bus on a given day. 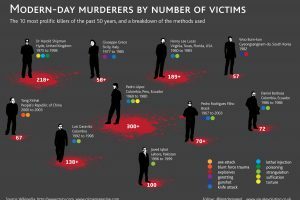 The personal injury law firm of Allen, Allen, Allen & Allen provided the below statistics about Virginia. When we put our children on the school bus in the mornings, we are entrusting the safety of our children to the bus driver. School bus drivers have a difficult job and must always be alert. They have to maneuver a large vehicle, often in heavy traffic and bad weather, while avoiding sudden stops or swerves that might injure their unbelted passengers. Unfortunately, every year there are accidents involving school buses that result in injuries and deaths to schoolchildren and other motorists on the highway. According to the Virginia Highway Safety Office, there were a total of 116,386 traffic crashes reported in 2010 throughout the state of Virginia. Of this total, 572 involved school buses that resulted in 248 injuries to occupants of those school buses. A variety of circumstances caused these school bus accidents: the driver was impaired by alcohol in 2 cases; the driver made an improper turn in 33 cases; the driver failed to yield in 42 cases; the driver was avoiding another vehicle in 5 cases; and the bus driver was following too closely in 21 cases. It is important for other motorists in the road to use extra caution around school buses and to learn and obey school bus laws in Virginia. School bus drivers use the “flashing signal light system” to alert motorists of their intentions. Yellow flashing lights indicate that the bus is preparing to stop to load or unload children. Motorists should heed the warning and slow down and prepare to stop. The red flashing lights and extended stop arms indicate that children are getting on or off the bus. The law mandates that motorists must stop their vehicle, wait until the extended stop sign is withdrawn, the red lights stop flashing, and the bus begins moving again before other drivers are allowed to proceed. It’s best to stop at least 10 feet away from school buses with red lights flashing to give the bus and children plenty of space. If you have been injured in a school bus accident, you should contact an experienced school bus accident attorney immediately. Cases against a school board or other governmental entity have strict statutory notice requirements and notice deadlines. If you fail to give notice in time in a school bus accident case, you may lose the right to pursue the claim. An experienced bus accident attorney can guide you through the statues and applicable case law. See Allen & Allen’s webpage about bus accidents for more information.